SCOTTSDALE, Ariz. -- The Phoenix Coyotes know all about how closing ranks and focusing on the task at hand can be therapeutic to a hockey team. The Coyotes were ravaged by injuries and suspensions during the first round but kept moving forward and beat the Chicago Blackhawks with some of their key players either sidelined or struggling. That's why no one in the desert was buying the idea that the suspension of Nashville forwards Andrei Kostitsyn and Alexander Radulov would do anything but galvanize the Predators as they look to crawl out of an 0-2 hole in the Western Conference Semifinals with a win on home ice Wednesday night (9 p.m. ET; CNBC, TSN, RDSI). The Nashville Predators will hold top-six forwards Andrei Kostitsyn and Alexander Radulov out of Game 3 against the Phoenix Coyotes on Wednesday for an unspecified violation of team rules. 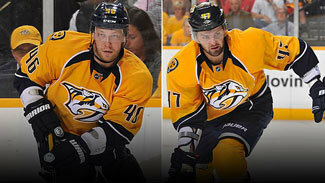 Both players were suspended by the Predators on Tuesday for breaking team rules during the team's trip to Arizona. Kostitsyn, who had a goal in each of the first two games, and Radulov are key components of a power play that has produced three of the six goals the Predators scored in the first two games -- but they were also defensive liabilities as the Coyotes scored nine times and took a 2-0 lead in a series for the first time since 1987. "I don't think it really matters," Phoenix goalie Mike Smith said. "They're in the playoffs; they're in the second round for a reason. They have good players. Obviously those two guys are a big part of their team, but depth has carried them through for most of the season, and the same with our team. "We can't focus on what's going on over there. We've got to worry about ourselves." The Coyotes lost forward Raffi Torres to a 25-game suspension for a Game 3 hit on Martin Hossa during the Chicago series and have had to play without Radim Vrbata, Martin Hanzal, Lauri Korpikoski, Rostislav Klesla and Michal Rozsival due to injuries at different points in the postseason. Coach Dave Tippett refused to let the missing players serve as a distraction to his team, so don't expect the Coyotes to worry about who's on the other bench. "Their lineup is inconsequential to us," Tippett said. "We've got to concentrate on the things that we have to do to that we think would improve in our game." Despite winning both games in Phoenix and scoring a postseason-high five goals in Game 2, Tippett said there is another level for his team to reach. The Coyotes have been very good on the road, sweeping three games in Chicago while allowing only four goals. Phoenix has won five straight on the road overall and is 6-0-2 dating back to a March 15 loss at Calgary. The Coyotes have won 23 road games this season, including both games in Nashville; they are 4-1-1 in Music City since Tippett took over three years ago. "Game 2 was obviously a better game than Game 1 for us, but we feel like there's still upside in our game," Tippett said. "We were able to get to the net and score some goals but there are still some issues. I think we can defend better. The adjustments we have to make going into Game 3 that hopefully continue to improve our game." The Coyotes played Game 2 without Korpikoski and Rozsival and could be without both again even with the three-day break between games. But Tippett was pleased with how both replacements – forward Marc-Antoine Pouliot and defenseman David Schlemko – performed in Game 2 and said he would be comfortable going with the same lines and defense pairings again. If the Coyotes see energy players like Jordin Tootoo or Matt Halischuk subbing for Kostitsyn and Radulov, they feel good that their fourth line of Kyle Chipchura, Daymond Langkow and Gilbert Brule has been very effective in the postseason. The three have combined for three goals and nine points while allowing Tippett the luxury of rolling his four lines. "If you look at it, we don't really have matchups," Tippett said. "Everybody plays against everybody and everybody's expected to do the job and those guys have done a heck of a job for us. Not just giving us quality minutes; they're creating chances. "Look at Brule (in Game 2) with six shots, three hits (in 11 minute of ice time) and he's also a very tenacious player. When your teammates see things like that they feed off it. The same thing with Chipchura -- he's always in the guts of the game. That's what we need from them."